The Warriors and the Raptors are likely headed for a collision course in the NBA Finals. 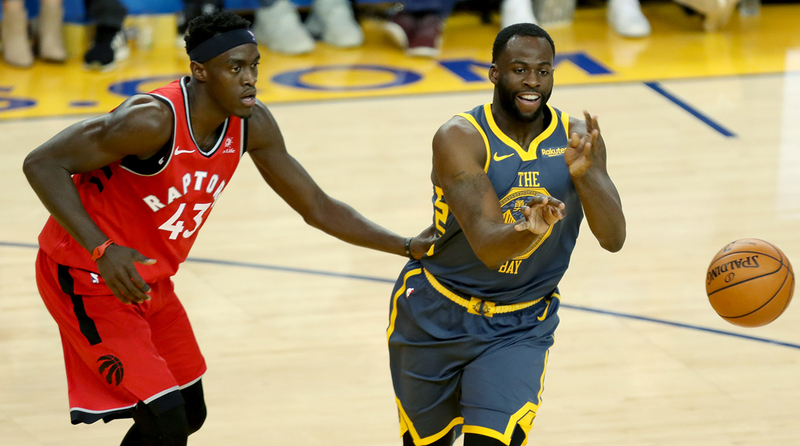 But before the playoffs start, the Open Floor podcast duo of Andrew Sharp and The Washington Post’s Ben Golliver answer email questions and discuss a hypothetical swap involving Most Improved player candidate Pascal Siakam and Draymond Green. Would Toronto rather have a proven vet or a rising star? Golliver: Stop disrespecting Draymond Green. I hate this stuff. You and all these listeners love to write off these players that were amazing two years ago and are little bit less amazing now. Like you are ready to put Chris Paul out and I can hear it in your voice—same thing with Draymond Green. Draymond is still a stud, he is going to crank it up in the postseason, just like he did last year. The Warriors have been cranking it up for the last two or three weeks—blowing teams out left and right and he is part of it. They have this regular season defense that is like 10th or 11th in the league right now and I am pretty confident that is going to be top one or two defense once the playoffs roll around. I understand we should give Pascal some love, he has had an amazing season. I would pick him for the Most Improved player but it is not the same thing—doing it in the regular season compared to doing it in the playoffs. Sharp: I do think it’s interesting because the comparison underscores what is a perfect situation it is for Draymond. I think on that team he is so huge for them and gives them everything they need in some areas—he covers some blind spots for them and they cover some blind spots for him. And if you put him on the Raptors, I don’t know if the Raptors would be better than they have been with Pascal Siakam, which is a crazy thing to think about and it says a lot about how great Siakam has been. The main reason why I included this question is because I think the playoffs are going to be where the rubber meets the road with the Siakam hype and we are about to find out how real this has been and how the real Raptors could be. Because they are the team that literally for like four months, I feel like we haven’t really talked about the Raptors at all and they could still go in and hang with anybody. As great as the Bucks have been, the Raptors are a couple wins off their pace and Kawhi has missed 20 games. They might be kind of a sleeping giant.